Dr. Sledge, professor and chief of medical oncology at Stanford University Medical Center, was referring to the avalanche of genomic studies that have begun to reveal multiple potential drug targets in individual tumors. The authors noted that during a six-month span in 2012, four papers published in Nature described the application of massively parallel sequencing techniques to hundreds of breast cancer samples providing a comprehensive catalog of somatic mutations that cause this disease. For example, Christina Curtis, Ph.D., et al.’s 2012 paper in Nature (“The Genomic Transcriptomic Architecture of 2,000 Breast Cancer Tumours Reveals Novel Subgroups,” Nature 486;346–352, doi:10.1038/nature10983) described the genomic and transcriptomic architecture of 2000 breast tumors. It revealed novel subgroups and a highly complex picture of the somatic genetic events driving breast cancer pathogenesis. Their integrated analysis of copy number and gene expression was performed in a discovery and validation set of 997 and 995 primary breast tumors respectively, with long-term clinical follow-up. Inherited variants (copy number variants and single nucleotide polymorphisms) and acquired somatic copy number aberrations (CNAs) were associated with expression in ~40% of genes, with the landscape dominated by cis- and trans-acting CNAs. By delineating expression outlier genes driven in cis by CNAs, the investigators identified putative cancer genes, including deletions in PPP2R2A, MTAP, and MAP2K4. Unsupervised analysis of paired DNA–RNA profiles revealed novel subgroups with distinct clinical outcomes, which reproduced in the validation cohort. 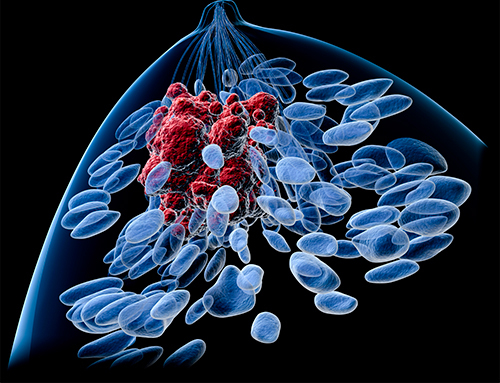 Their results, the authors said, provide a novel molecular stratification of the breast cancer population that is derived from the impact of somatic CNAs on the transcriptome.